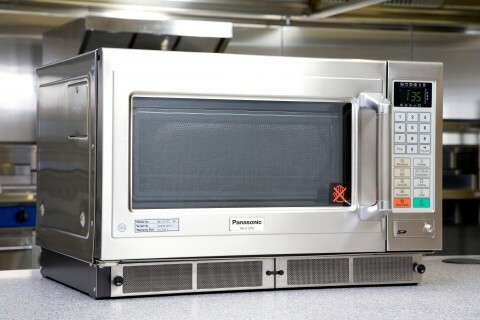 The perfect solution for catering professionals, the Panasonic NE-C1275 Combination Touch Control Microwave is ideal for cafes, deli’s, restaurants, canteens, hotels and much more. The interior and exterior of the unit are both made from a robust stainless steel, specifically designed for sustained long-term use. With up to 99 programmable menu items the NE-C1275 can help to simplify cooking while still keeping your results consistent. Each programme can be preset with up to three stages of combination or single cooking styles. It features a high speed 4 element quartz fan grill and grill convection which ensures faster cooking and browning results. The microwave also has 6 power levels and a dual emission bottom energy feed which ensures the heat is evenly distributed. The unit’s fast cool features quickly reduce the oven’s temperature to allow for easy cleaning and lower temperature cooking. You can programme the microwave either manually, with a removable SD card of using your personal computer. The microwave’s interior has a 29.6 litre capacity and two shelf positions as well and one wire rack and one ceramic tray.